Alain Caron is a Canadian jazz musician born in Saint-?loi, Quebec, the youngest of 11 children. 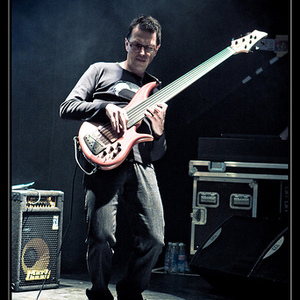 He is considered as one of the greatest masters of the 6-string bass guitar. His musical skills were formalised by correspondence lessons with the jazz improvisation teacher, Charlie Banacos, and by attending a summer session at Berklee College of Music. In 1977 he joined Michel Cusson group, that became known as Uzeb (with Michel Cusson guitar and Paul Brochu drums), and recorded 10 albums between 1980 and 1990. His musical skills were formalised by correspondence lessons with the jazz improvisation teacher, Charlie Banacos, and by attending a summer session at Berklee College of Music. In 1977 he joined Michel Cusson group, that became known as Uzeb (with Michel Cusson guitar and Paul Brochu drums), and recorded 10 albums between 1980 and 1990. He has also been a session musician with Leni Stern.